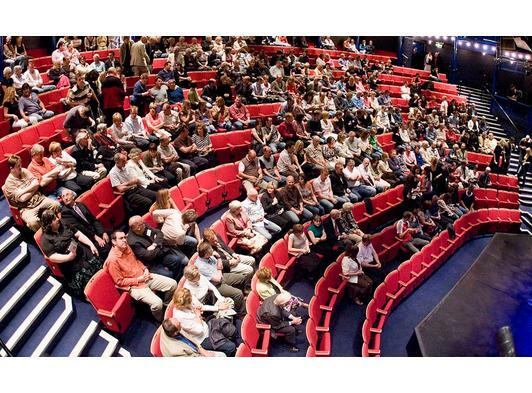 Our cosy 400 seat auditorium offers a clear view of the stage from all seats. However, depending on the style of production some seats offer a view that works better with the design of show or style of performance. We split our auditorium into four price bands to offer a range of prices based on where we feel the optimum viewing experience will be. You often ask us why the front two rows of the theatre are such a bargain. The reason? We love having the front of the auditorium full for every show and we believe there should be accessible priced tickets for all. Our Café Bar is a lovely place to eat or to have a drink at any time – no ticket required! The Café Bar is open from 10am to the end of the last interval of the day Monday to Saturday. We close at 3pm when there is no evening performance and on Sunday's and Bank Holiday's we'll be open 2 hours before the performance. So whether you're popping in to book a ticket or heading into to town to shop, the theatre is a pleasant place to enjoy morning coffee and lunch – and, of course, it’s ideal when you are seeing a show, especially if you're taking advantage of our new pre-show set menu. We offer a wide range of beverages including a variety of wines, beers and spirits. Opening one hour before the show, the Bar is the ideal place to catch a post-show chat with cast and crew members. Don't forget to order your interval drinks too.